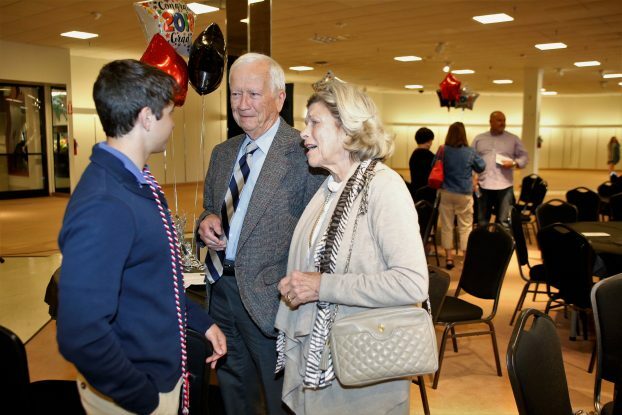 SALISBURY — Crosby Scholars ushered in graduation season with its third Senior Gala on April 29. The program celebrated this year’s graduating class of 145 Rowan-Salisbury Crosby Scholars seniors. The class of 2018 has provided the community more than 8,800 hours of volunteer service and participated in 1019 hours of academy workshops. As Crosby seniors, they received one-on-one college advice and assistance with the college application process. The students — 33 percent of whom will be first in their families to go to college — will attend college as far away as Seton Hall and Vanderbilt and as close by as Rowan-Cabarrus Community College. Rowan-Cabarrus, for the third year, is the top choice for Crosby Scholars seniors. Appalachian State University and the University of North Carolina at Charlotte round out the top three. A highlight of the afternoon was keynote speaker Phil Kirk’s message to the seniors. Kirk, a native of Salisbury, told stories about his time as chairman of the State Board of Education. After the speech, the Crosby Scholars were invited to walk across the stage as their names and college choices were announced.